The Miramar Santa Monica is located on a site prominent both for its location, where Wilshire Boulevard meets the Pacific Ocean, and its central place in Santa Monica’s rich cultural history. As the hotel approaches 100 years of age, it has suffered a long history of incomplete conceptual planning and several piecemeal renovations. Our new plan aims to rectify this and reestablish the Miramar Santa Monica as a world-class destination ensuring a beloved community asset for the next 100+ years. 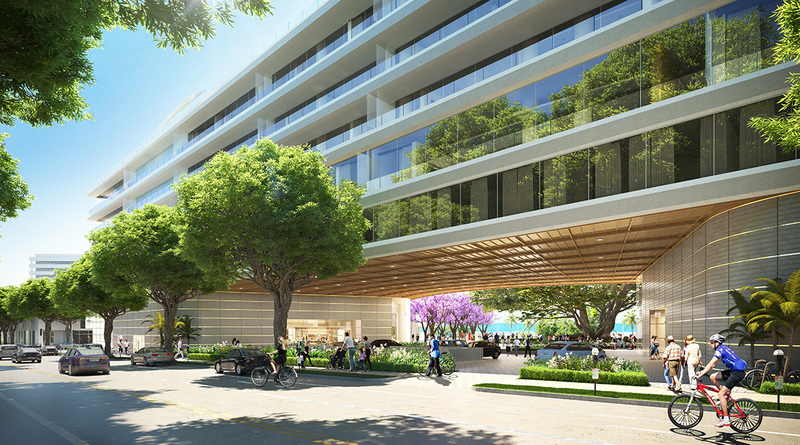 When complete, the Miramar will be a new landmark and a spectacular addition to Downtown Santa Monica. It features the preservation of two local landmarks and the addition of magnificent new open spaces encouraging pedestrian activity to and through the site. It celebrates the site’s rich history while incorporating bold, contemporary architecture and stunning landscape design and aiming for the highest levels of sustainability. The project’s new open spaces include two gardens that celebrate the Miramar’s history by featuring and reestablishing public access to the Moreton Bay Fig Tree and celebrating the Palisades Building. World-class architecture and landscape design is thoughtfully integrated with historic preservation and community enhancement, ensuring that the Miramar Santa Monica will be a place of prominence and continuing its legacy as an iconic destination. A copy of the Concept Design Package submitted to the City of Santa Monica can be found here. A copy of the Miramar Redevelopment Presentation can be found here. Approximately 14,000 sf publicly-accessible garden at the corner of Wilshire Boulevard and Ocean Avenue, including a prominent work of public art.